NextStage recently introduced TimeSlips, an improvisational storytelling process founded on the idea that expressive arts plays an important role in healthy aging, at the Annual Alzheimer’s Conference held at Mount Hermon Conference Center in April, 2017. This evidence-based program is part of a National Caregiving Initative of the NCCA National Center for Creative Aging. 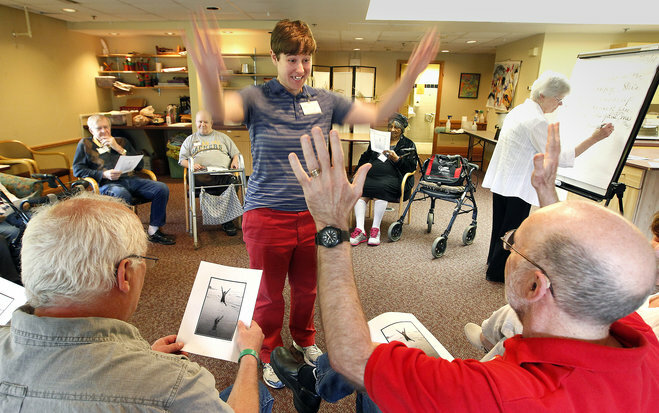 “By replacing memory with imagination we build a communications bridge with individuals experiencing memory loss”, says Lynn Knudsen director of NextStage. NextStage has expanded its mission of Lifelong Learning and Training in Performing Arts for ages 50 and older in include Artful Aging – a health and wellness initiative. Interested in training to be a TimeSlips facilitator? Contact Us!